Capt. John Milton Dobie Milton or "Milt" to his friends, was born on the family farm outside of Chatsworth, Ontario on December 6th, 1887. 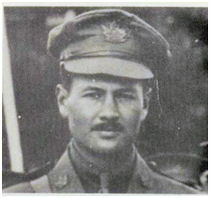 John was one of eight children and two of his brothers, Howard and Victor, also served in the Canadian Expeditionary Forces, having both been conscripted in early 1918. Milton's early education was conducted at the local public school in the nearby town of Chatsworth and he completed his Normal School Entrance and Matriculation examinations in 1912 at Owen Sound Collegiate Institute, where he was a member of that school's Cadet Corps. Upon graduation he was taken on staff of the Owen Sound Sun newspaper, as an associate editor as his writing style was described as clear, graceful and a gift that few possessed. Having taken up residence in Owen Sound, John became a member of the Division Street Presbyterian Church, where he belonged to the choir and its Young Peoples Guild. Other interests had him belonging to the Orpheus Chorus, the Independent Order of Odd Fellows and he was also an active member of the local Militia unit, the 31st Regiment, having served with them for over three years. When war broke out Milton took his commission with the 147th (Grey) Battalion as a platoon commander and prior to sailing the Division Street Choir presented him with a wrist watch while the Orpheus Chorus gave him a set of military brushes. When the unit was quarantined in Amherst, Nova Scotia, due to an outbreak of diphtheria, Lieutenant Colonel McFarland would have Lieutenant Jucksch form a Glee Club which consisted of the three of them, as well as Major Fleming. This Glee Club would stay together entertaining where ever they could, until they were eventually broken up when they were sent to France. Lieutenant Dobie was picked up in a Draft to the 4th Canadian Mounted Rifles and reported to the unit on the 21st of April, 1917, in the vicinity of Avion, during the advance on Lens. He served with the unit through Passchendaele, attending several courses and on completion of his Captaincy course he was promoted to Captain on the 5th of July 1918, and was granted 14 days leave soon after. Like many of the soldiers of the day he took his leave by travelling up to Scotland before returning to the battalion on August the 11th, just before the start of the Second Battle of Arras. It was during the opening days of this battle that Captain Dobie was felled by a single bullet on August 28th, 1918. Lieutenant Spencer would write in his published letter: "I have located Captain Dobie's grave and erected a temporary cross on it to mark it. He lies practically at the point to which he had gallantly led his men in the attack, a little to the south of the town he helped to capture, along a road that one can easily find. I believe that his death was painless and instantaneous, and also his body was not mutilated save by a single bullet wound.". Lieutenant Spencer's account is further substantiated by the remarks column of Circumstances of Death Registers where his death was recorded as: "Killed in Action" - "While in command of his Company during a successful attack South of Boiry, after gaining the objective, and about to consolidate at Lady's Lane, he was instantly killed by an enemy Sniper's bullet, which hit him in the shoulder and passed through his heart.". Captain Dobie's final resting place is along the Arras-Cambrai road in the Vis-en-Artois British Cemetery and his name is also embossed on the Chatsworth Cenotaph, O.S.C.V.I's. memorial plaque, the Division Street Church's memorial plaque and book, as well as the I.O.O.F. memorial located in Greenwood Cemetery. His name would also be carried on in remembrance when Captain Tom Rutherford named his first born son, Jaffray Milton Rutherford, after two of his fellow officers killed in the war: Lieutenant Jaffrey Eaton and Captain John Milton Dobie. Thanks and credit for the details and provision of the image of John Dobie go to George Auer.